As you scroll down through your dashboard, you’re provided with a Content Snapshot that highlights metrics for your posts with the highest engagement score. You can select Dive deeper to view all of your Content Performance. This is also available by selecting Content > Performance on the left sidebar. In the top right hand corner, you can select the appropriate reporting time period (4 weeks, 8 weeks, or 1 year). The following Insights are based on the selected reporting time period. Engagement Score - this score is based on an algorithm that takes into account your organization's Open and Click-Thru Rates. Opens - how many times newsletters containing this post have been opened. Clicks - how many clicks this post has received. Reach - how many people this post has reached. Normally, this is the same as the number of people that have seen that story - but if the story was shared, Cerkl tracks that too. Shares - how many times this post has been shared. Your subscribers can click the social icons at the top of each post to share on different social media platforms. Likes - how many times this post has been liked by your audience. The option for someone to Like the post is symbolized by a star at the end of each post. Comments - how many comments this post has received from users. The option for audience to comment is available at the end of each post. 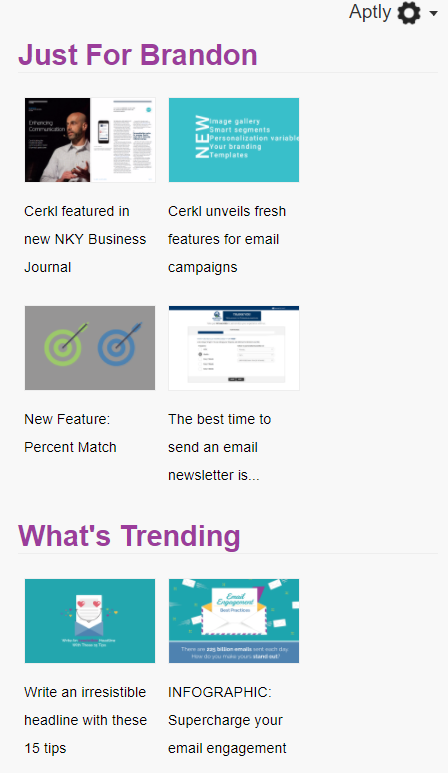 Aptly Views - Our Aptly feature offers the personalization your subscribers enjoy in your newsletters - also available on your website and on any content produced in Cerkl. The screenshot below is an example of how Aptly looks on a website or beneath your content. If content is viewed through the Aptly feature, this will count as an "Aptly View" for that piece of content. Below is how Aptly looks on your website!